We began the 2017 CapCon! season the same way we did in 2016, with a "No more tri-folds" blog post and lesson. The 2017 vision was the same as 2016, to create a professional learning conference experience driven by students, their research, and their work. 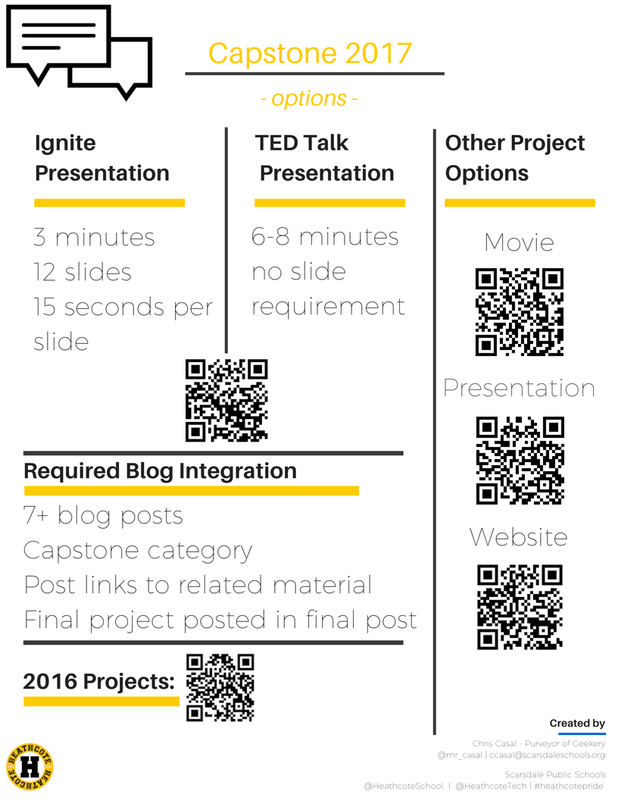 Just as last year, we spoke a lot about Ignite talks, TED Talks, professional quality documentaries (we used 60 Minutes and Real Sports as reference points). What we learned from 2016, however, was that we needed to start earlier in the year. We began talking about film making, Ignite and TED talks months before CapCon! began. We gave students opportunities throughout the year to make movies, give talks, and explore the different ways to tell a story and convey their message. 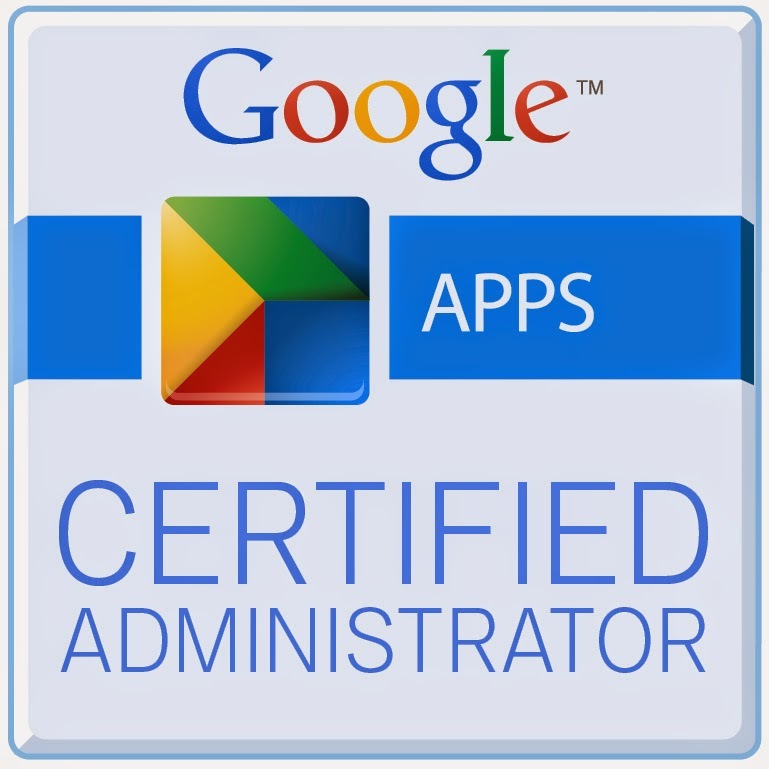 By doing so they were more prepared to make an informed decision about which format to choose for CapCon! 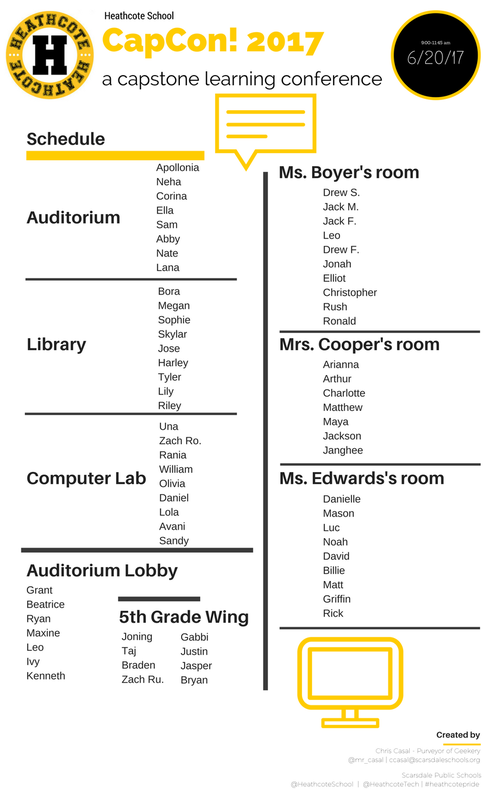 The 5th grade team; Christine Boyer, Ashley Cooper, and Cristal Edwards were amazing in preparing their students as well as serving as mentors throughout the process. Maria Stile, our Principal, was an amazing support and champion. 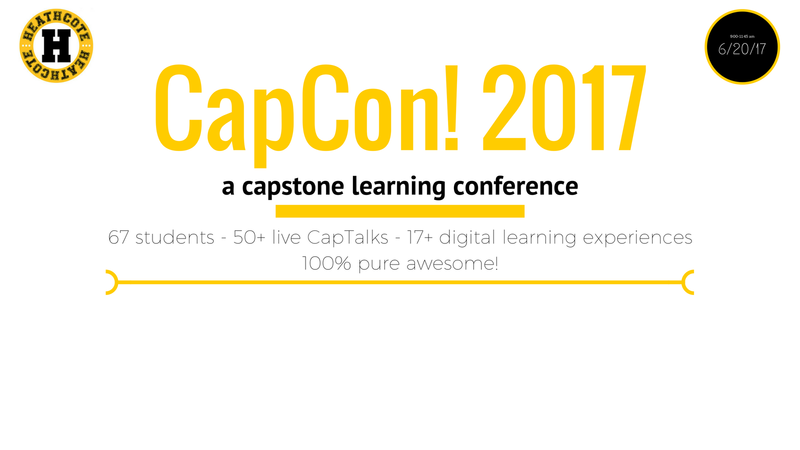 We were building upon the wild idea of CapCon! 2016. Last year it was new and we had plenty of room to fail. This year we had our own example to live up too. This year was less of a huge leap of faith that it was last year, it was a challenge to succeed again. 2016 set the bar pretty high. 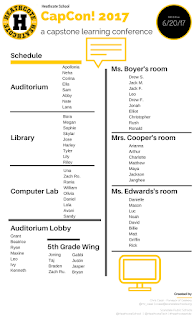 Once again, it would never have been as successful as it was had it not been the confidence and support of the 5th grade team, administrators, and school as a whole. 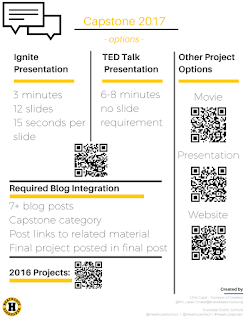 The 2017 framework included a link/QR code to the 2016 projects so students had the ability to independently review past student work. 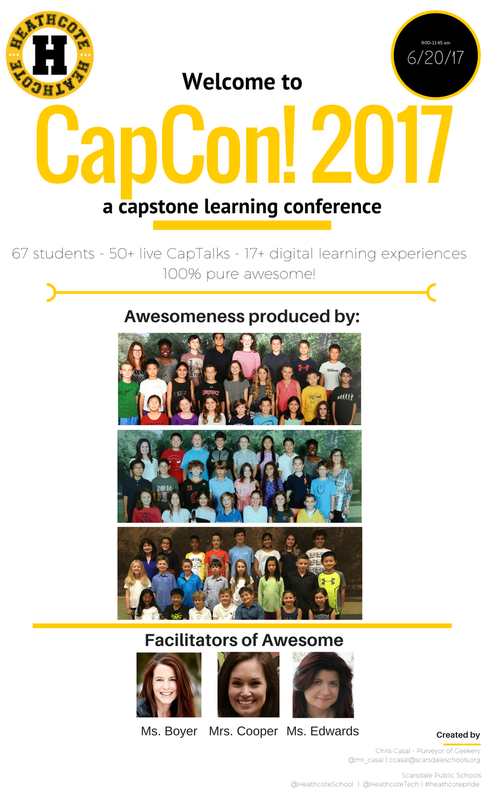 Again, the biggest takeaway from 2016 was that the entire 2017 school year needed to have small opportunities for students to experience all the possibilities before CapCon! Students did Ignite talks about their favorite places in school in the Fall. During a social studies unit they made documentaries with iStopMotion, iMovie, and WeVide to experience the filmmaking process. By the time we talked about CapCon! requirements students had all had exposure to the possible formats. We promoted CapCon! with posters around the building as well as tweets from the school account as well as individual teacher accounts. We wanted people to know the great efforts our students were putting forth and the great works they were creating. We wanted our students to create professional-quality research projects, so we treated them as professionals. 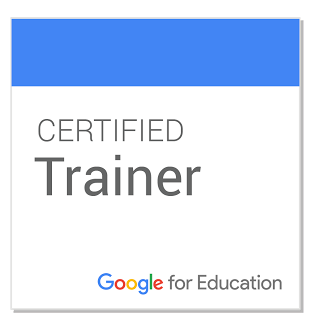 Professional learners, creators, makers, and presenters. 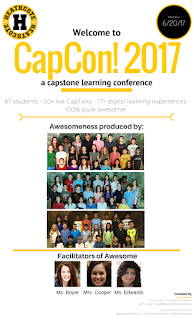 On the day of the event, June 20th, we welcomed parents to CapCon! CapCon! 2017 was a resounding success. We took on the challenge of improving over CapCon! 206, which wasn't an easy feat. Once again this wasn't a tri-fold museum walk. CapCon! 2017 was a professional learning conference, driven by students. CapCon! 2017 was amazing. The students once again floored us with their commitment to their projects, to their willingness to step out of their comfort zones, to give speeches, to fine-tune projects with detail and precision, to so wholly commit themselves to their process and product. I was humbled by their efforts and impressed by their results.